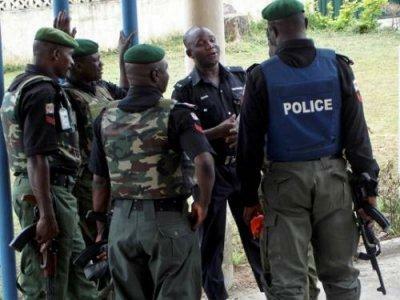 There was panic Monday morning at the Railway Post, Umuahia, Abia State when police officers attached to the post allegedly manhandled a man later identified as an Army captain for packing his 18-seater Mitsubishi bus close to the fence of the Police station. According to eye witness accounts, the Divisional Police officer in-charge of the police post was said to be driving into the station when he spotted the bus and ordered the owner to repack the bus claiming that it was blocking his way. Vanguard reports that , the Army captain who was in mufti, was said to have come out, greeted the DPO and quickly wanted to repark his bus. But the police officer was said to have ordered him to come closer and explain why he should block his way to the station. The army officer was said to have continued to plead with the angry police officer when he refused to allow him to remove his vehicle to re-park. Rather, he was alleged to have ordered his men to arrest the man, who at that juncture unveiled his identity, which was doubted by the police officer who insisted that he must be arrested. The scene attracted passers-by and people doing sundry businesses around the area, who also joined to plead with the police officer who refused to budge and insisted that the soldier must be arrested. “He must obey my arrest order; you people should tell him to obey my arrest order. You must obey my arrest order, you said you are a captain, you must tell me how many wars you have fought. “I have fought in three Boko Haram states of Borno, Adamawa and Yobe before coming here, you must show me your identity today; drag him into the cell now,” the DPO whose identity was not immediately known was yelling. However, the tables turned against the ‘powerful’ DPO when four soldiers arrived at the police station and discovered the man being molested was actually an army captain, and they became angry that an officer was calm and gentle to plead, yet he was being disgraced by the police officer. They called for reinforcements and in less than 15 minutes, four Hilux vans loaded with soldiers, arrived the police station. They later took away the DPO and another police officer with them to their base, after giving them the beating of their lives. The police have colonized the parking lots around the area, harassing and ordering motorists not to park vehicles around the area, as they always block the road that passes through the station.